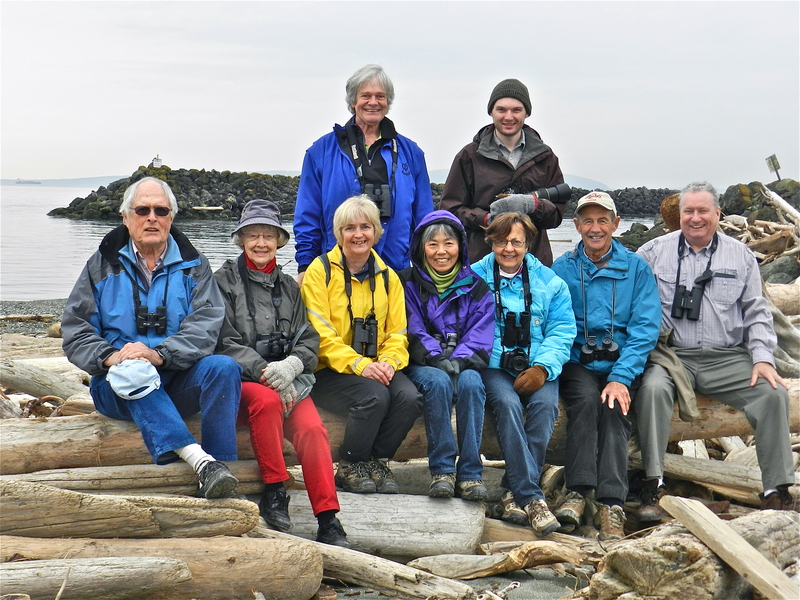 Nine of us (Anne M, Ken B, Eleanor, newbie Eric, John McF, Kay G, Marian P, Point Bob Paul and me) enjoyed a very productive Wednesday morning of birding at Point Roberts, USA. We had lots of hi-lites including: Red-necked and Horned Grebes, Pacific Loons, Rhinoceros Auklets, Common Murre, Harbour Porpoises, many ducks in beaut plumage (Harlequins), Hairy Woodpecker, first Violet-green Swallows, Caspian Tern, Sanderlings and hundreds of Brant Geese. 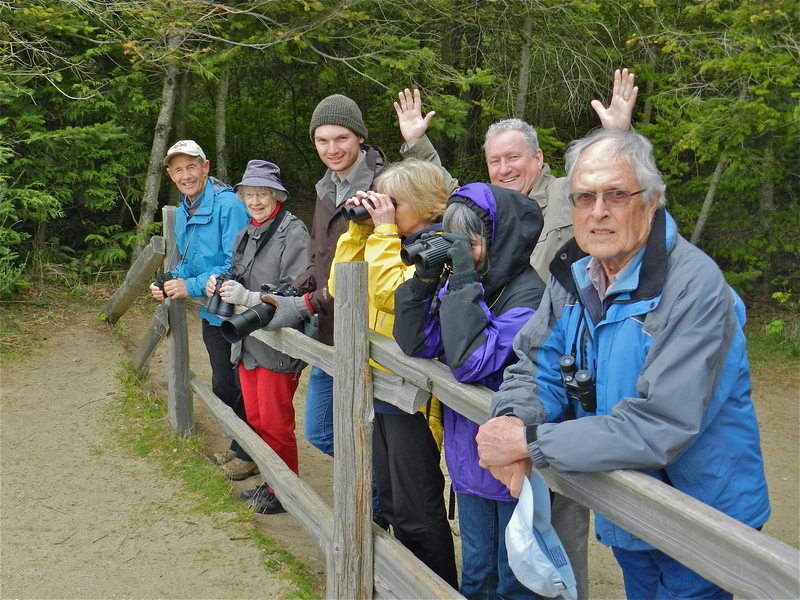 Enjoy Eric’s, Marian’s and Ken’s photos of the outing on our DNCB Picasa site at http://picasaweb.google.com/dncbirding. We (Group of Seven) had no problems crossing the border in Anne’s van and got to Lighthouse Marine Park around 8:30 a.m. where Marian and Paul met us. Marian had already photographed a Belted Kingfisher sitting on a pylon. The water was unusually flat, and although most birds were a ways out, we could see them fairly well. Several Common and Pacific Loons were close enough to shore for identification comparisons. Lots of Surf Scoters and Common Goldeneye hanging around the pylons where both Double-crested and Pelagic Cormorants were roosting. 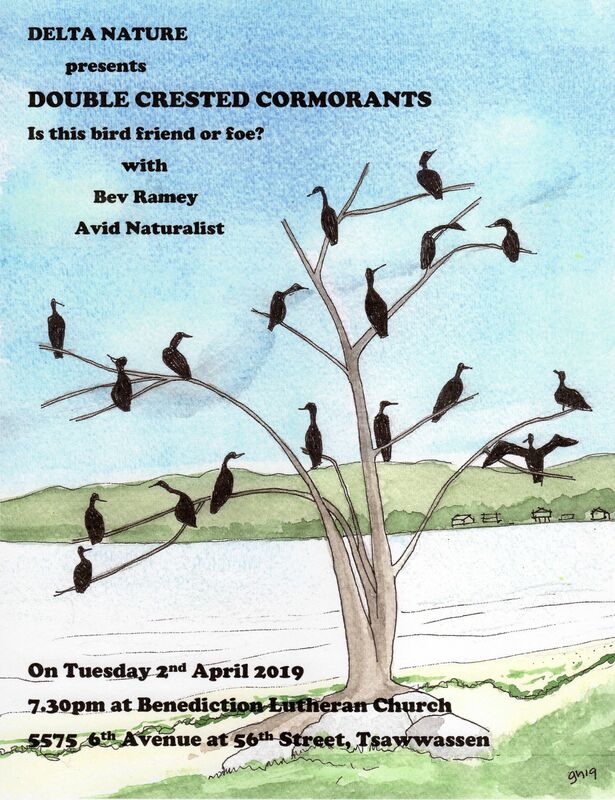 Among the Cormorants was a flock (25) of resting Sanderling. A Horned Grebe, already approaching breeding plumage, was diving in front of us. Later on we saw a Red-necked Grebe among some pairs of gorgeous Harlequin Ducks and Harbour Seals. We wandered along the path toward the “stand” at the corner; lots of Savannah and Song Sparrows along the shore. A noisy Killdeer (possibly nesting there) caught our attention, while a pair of Red-breasted Mergansers seemed to follow us. A few Harbour Porpoises flashed their fins in the distance and Anne was able to identify a few Rhinoceros Auklets and a Common Murre in the scope. A Caspian Tern did a fly past, as did several large flocks of Brant Geese (hundreds). We walked back to the parking lot via the shrub trail; some saw a Yellow-rumped (Audubon) Warbler, White-crowned Sparrow and Bewick’s Wren. We drove to the other side of the Marina where we usually see Black Turnstones. 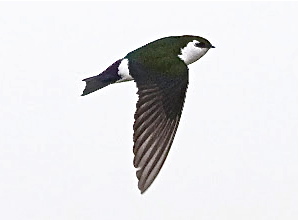 None were there, but lots of Violet-green Swallows flitting around us. A nice flock of Greater Scaup came close. Bufflehead and Gadwalls were in the pond by the condos, and a Red-tailed Hawk was perched near its nest. Ken took the Group Photo here, but no one brought any goodies for a Smoko. I felt weary and weak the rest of the morning. We drove on to the new parking lot at Lily Point Park, passing Scottish Highland Cattle and Icelandic Ponies. Point Roberts Paul “took over” as leader and guided us on a neat trail along the bluff. At the lookout we saw lots of the same waterfowl species below us as we enjoyed the beautiful view across to White Rock, Blaine, the San Juan Islands and Saturna. Bald eagles soared in front of us. No whales sighted (Richard Swanston saw a Grey Whale spouting there later in the afternoon). We heard, but couldn’t find, a Purple Finch, but had great looks at a Rufous Hummingbird, Ruby-crowned Kinglet, Brown Creeper and a Hairy Woodpecker. Paul pointed out several of the rock formations that Mindy Brugman had explained in her passionate presentation on the Cliffs of Lily Point which she gave to the “sold-out crowd” of Delta Nats on Monday evening at Cammidge House. We left Lily Point around noon, exhilarated by the enjoyable and productive morning spent in the USA. 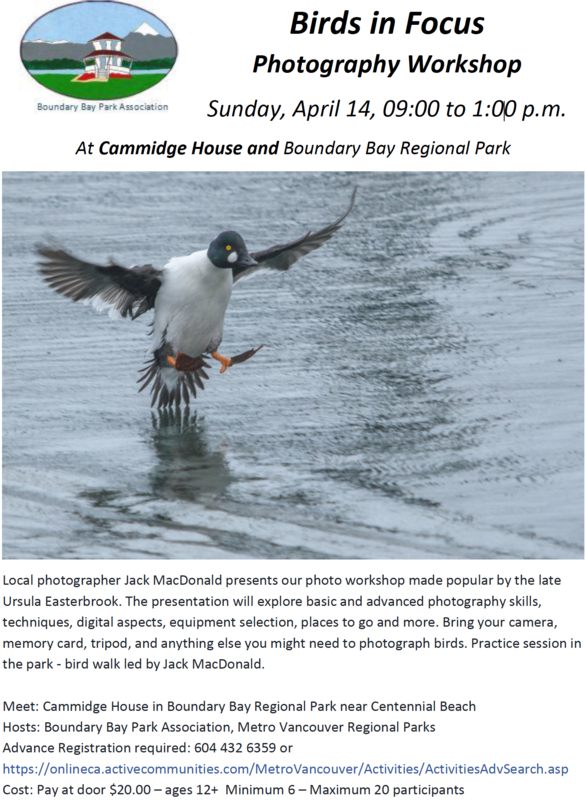 I will be leading a Bird Walk this Sunday, April 15 at Watershed Park in North Delta in conjunction with the Fish Release Program organized by Delta Corporation. The Walk starts at 11:30 a.m. from Pinewood Elementary School and ends around 12:30 p.m. at the Watershed Fish Release, where Delta Nats will have their Display set up. Info on the event is at http://www.corp.delta.bc.ca/EN/main/municipal/upcoming-events/upcoming/earth_week.html. Join me if you can. Next week our Delta Nats Display will be at Delta’s City Hall from Monday to Thursday in conjunction with Earth Week. 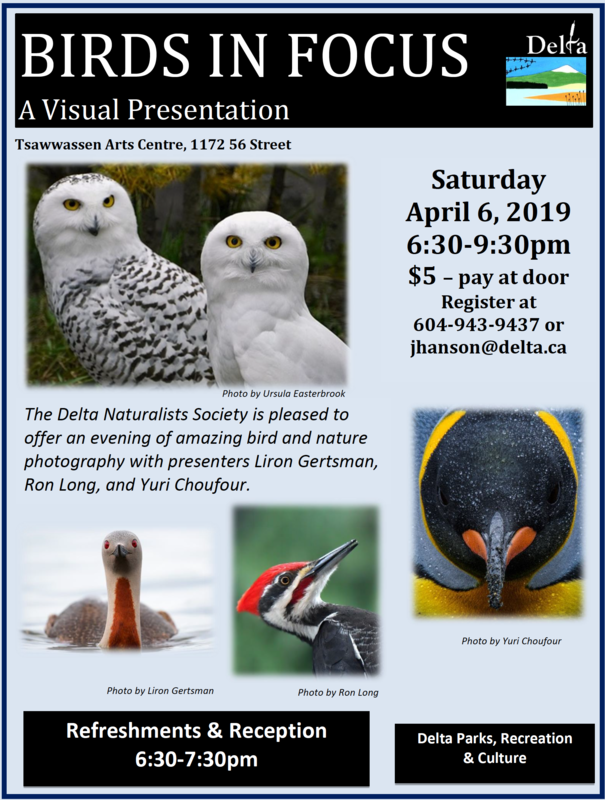 DNCB’s will meet next Wednesday, April 18, at Petra’s, departing at 8:00 a.m. on an outing “somewhere around the Bay”, destination to be determined (perhaps Beach Grove Park to see the baby Great Horned Owls, and BBRP to see the Hudsonian Godwits (Roger M’s), Eurasian Teal, Mountain Bluebirds and Curlew). Comments encouraged, check out our DNCB Blog at www.dncb.wordpress.com, and let me know if you want off the list to receive this drivel. This entry was posted in *DNCB, Lighthouse Marine Park, Lily Point Park, Point Roberts. Bookmark the permalink.